Indian-based tech company Smartron has decided to dip its toes into the world of fitness trackers for the first time, and if its tband really delivers what it promises, it could be one to keep an eye on. The iOS and Android friendly tracker features a 0.96-inch, 128 x 64 resolution OLED display that's held around your wrist with an 18mm silicon strap. It's been stamped with an IP67 dust and water resistant rating, which means unfortunately it's not fit for the pool. On the sensor front, it's packing a pretty standard-sounding 3-axis accelerometer, an optical heart rate monitor, but it also has as an ECG sensor to deliver more medical-grade levels of heart rate accuracy. The motion sensors unlock the ability to track steps, measure distance and track running pace. It will also automatically track your sleep. But it's the health tracking that's really interesting here. ECG measurements are taken using an ECG electrode while blood pressure is done via the PWTT method or Pulse Wave Transmit Time. That means it should use ECG and the optical heart rate sensor (PPG) simultaneously to produce a blood pressure reading. We say should, because it's not very well explained and we have asked Smartron to clarify exactly how the blood pressure monitoring works. Current wearables like the Apple Watch require being paired to a dedicated blood pressure monitor to generate a reading. Health tech company Omron is working on getting FDA clearance for its HeartGuide smartwatch that disguises the traditional BP cuff inside of the watch body. 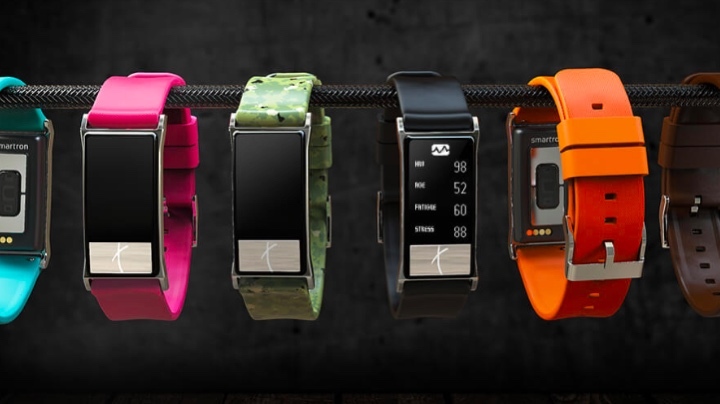 So if the tech housed inside of Smartron's band can deliver reliable health data, then that's pretty impressive. Those health sensors additionally promise to offer insights into stress, sleep efficiency, fatigue and can be viewed from the companion smartphone app. There's apparently enough onboard storage for 14 days worth of data, 10 ECG and blood pressure records as well as 1200 minutes of heart rate and pace data at three second intervals during training. There are also some smartwatch-inspired features on there too like call and text alerts, customizable alarms, weather updates, as well as activity trends. The 100 mAh capacity battery will muster up 2 to 3 days of use depending on how much you put those sensors to use. The tband is going on sale in India only with a price of ₹4,999(roughly $74). We'll be seeing if we can get our hands on one to see if this feature-packed health and fitness tracking band is as good as it looks on paper.